The thrust front of the southern Italian Apennines is formed by a north-east verging imbricate fan, transversally cut by several major rivers draining to the Ionian Sea. In the Lucanian segment of this frontal (i.e. external) part of the orogen, the tectonic stack is composed of Cretaceous-Oligocene deep-sea water clayey successions and Miocene silici¬clastic units that was embedded during Neogene and Quaternary times. Currently, it is still debated if the recent contractional deformation continued until now in this external part of the orogenic chain. In fact, field data show a recent shortening not younger than the Middle Pleistocene. On the other hand, geomorphological features clearly indicate that the whole area suffered a significant uplift in more recent times. This study will try to discriminate the recent and active tectonic deformation in the light of an accurate morphotectonic analysis, based both on the study of terraced surfaces and morphometric indices. The analysis of fluvial terraces revealed that the study area underwent a diffused uplift during the Late Pleistocene. In the Holocene, the same area seems to be affected by a differential uplift due to tectonic tilting toward south-east, as also supported by the increase of the sinuosity index (SI) of the Bradano River. The tectonic imprint on the landscape has been adequately proved by other indices such as the asymmetry index (AF), the valley floor slope (VFs), and the normalized stream length-gradient index (SLk). The mapping of SLk values has also shown that the anomalies follow a NW-SE trend, suggesting a very recent activity of the external ridges. Moreover, swath profile analysis has shown altimetrical peaks that are topographically corresponding to the main outcropping thrust and more external buried structures located in the foredeep. 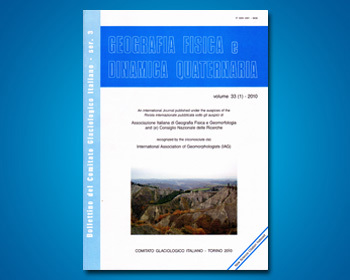 The geomorphic analysis led to the consideration that the frontal portion of the Lucanian Apennine is still tectonically active, even though its recent evolution has not been laterally uniform.